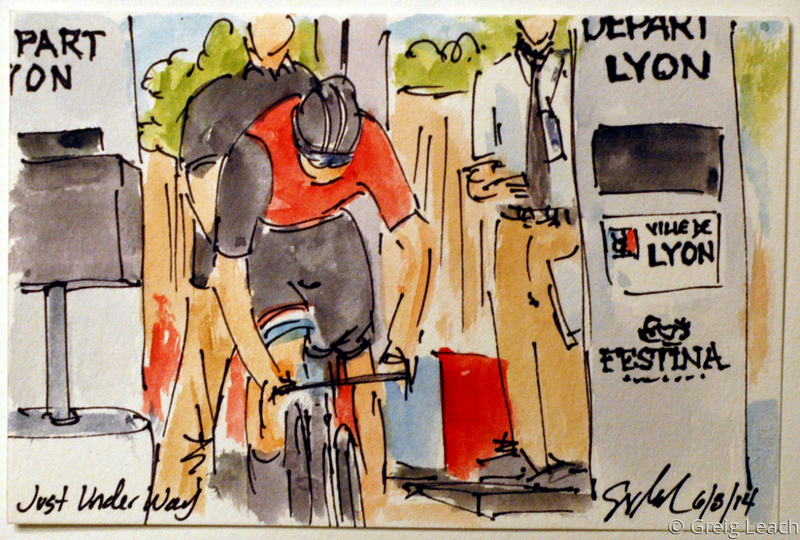 This title is doing double duty, first as a description of the action as Bob Jungles (Trek Factory Racing), the Time Trial Champion of Luxemborg, gets underway in the opening time trial of the Criterium du Dauphine, and two, as an apt description of my starting in on painting the eight coming days of racing through eastern France. The Time Trial is often called the race of truth as each rider is competing on his own against the clock, no drafting, no strategy and no team helpers. Jungles was one of the earlier riders to start out and posted the best time for the 10 kilometer course that stood until almost the final rider crossed the finishing line. This is an original watercolor and ink postcard measuring four inches by six inches and was created using Yarka St. Petersburg watercolors and Steve Quiller brushes from www.richesonart.com. They are a family owned (and run) American art supply company based in Wisconsin that provide exquisite materials for all sorts of art making projects.